Medical device based on polysaccharides, especially designed to relieve throat irritation associated with pain, burning and sensitivity to swallow. Ingredients: Marshmallow root extract standardized in polysaccharides, Iceland Moss Thallus extract standardized in polysaccharides, ascorbic acid, propolis extract, sorbitol, mannitol, aspartame, talc, magnesium stearate, silicon dioxide, orange flavour, peppermint essential oil, Eucalyptus essential oil. 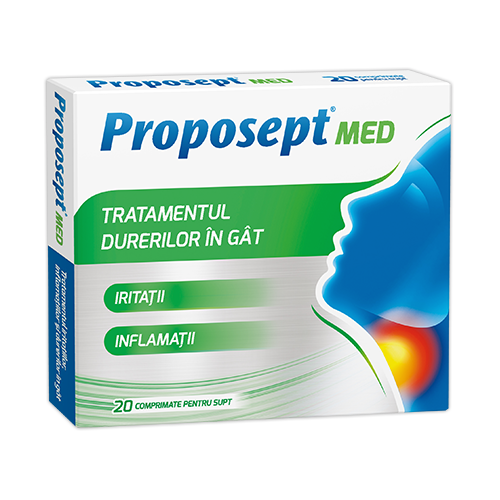 PROPOSEPT® MED is recommended for the treatment of throat irritation and inflammations associated with pain, burning and sensitivity to swallow. • Children over 6 years: 1 compressed lozenge every 4 hours; it can be administered up to 5 compressed lozenges per day. • Children over 10 years and adults: 1 compressed lozenge every 2 hours; it can be administered up to 10 compressed lozenges per day. Keep the compressed lozenges in the mouth to dissolve slowly. Do not chew the lozenge! It is recommended not to drink or eat anything for half an hour after the administration of the lozenges. It is recommended the use for 2 weeks. If the symptoms persist or worsen after 5 days, consult a doctor. Cardboard box with 1 blister containing 20 compressed lozenges. PROPOSEPT® MED is a class I medical device, non-sterile and without measuring function, in accordance with the European Directive for medical devices 93/42/EEC.